Clay Matthews has four sacks in three career games against the Eagles. The Philadelphia Eagles head into their Week 12 matchup with the Green Bay Packers still very much in the playoff hunt, but also very much in need of a win to stay that way. The Packers will come limping into Philly with a four-game losing streak, and desperate to stay alive themselves. Those teams combined for a record of 30-82, which, hang on, let me check with my team of scientists... yes, I've confirmed with them that that's bad. They've been particularly bad defending tight ends, according to Alex Smith of the Eagles. Packers are one of only four teams in the NFL to allow 700+ receiving yards to opposing TEs. This is an Ertz, Celek and Burton kind of game. Eagles offensive coordinator Frank Reich attributed the Packers' poor play on the back end to injuries. "They have been dealing with a lot of injuries," he said. "I know [Packers defensive coordinator] Dom Capers. I played for Dom Capers for a year when he was the head coach with Carolina. I played against him many times and I have a lot of respect for Dom as a football coach, as a defensive coordinator and as a person. He's got very good schemes." Whether it's Ertz, Celek, Burton, Matthews, Agholor (lol), DBG, Treggs, or the legendary Paul Turner, the Eagles have no excuse not to make some plays this week against Green Bay. A week ago against the Seattle Seahawks' makeshift offensive line, the Eagles' defensive line had one sack for a loss of zero yards. That doesn't mean they didn't often beat their blocks when they were pass rushing. Seahawks quarterback Russell Wilson simply did an outstanding job eluding the rush and making plays on the run. Packers quarterback Aaron Rodgers has also made a career of keeping plays alive with his feet and throwing on the run, as noted by Jim Schwartz. "It's tough," said Schwartz. "There's a lot of carryover from last week with Russell Wilson. Puts a lot of stress on your defense from an ability to extend the plays. He's made a lot of plays this year with his feet, including scoring touchdowns, getting first downs. Also creating time to make plays down the field." How well the Eagles adjust their game plan against a second straight mobile quarterback this week could be the difference between three-and-outs, or long extended drives. While the Eagles' depth along their offensive line has held up this season, there will be yet another shuffle Monday night, as Allen Barbre is expected to slide over to RT in place of the injured Halapoulivaati Vaitai. In that event, Stefen Wisniewski would fill in at LG, as he has done on occasion already this season. While the Packers are a mess defensively, they do still have dangerous pass rushers in Clay Matthews, Nick Perry, and Julius Peppers. 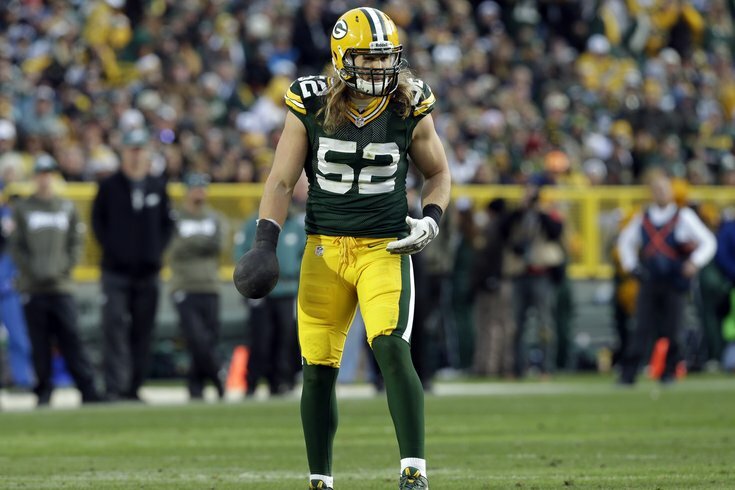 "The one thing is that they have 52 [Packers LB Clay Matthews] healthy, and everyone says that they're a different team when he's on the field because he's an impact player," said Reich. "So it will be a good challenge for us." Matthews has wrecked Packers-Eagles games in the past. The Eagles have to make sure they know where 52 is. The last time James Starks started a game against the Eagles, he went off for 123 yards in the 2010 playoffs. Green Bay has not had much of a threatening rushing attack ever since Eddie Lacy went down with an ankle injury, and even before that, they weren't exactly steamrolling anyone. The Eagles have largely been good against the run this season, with notable exceptions being the Redskins game, and the long touchdown run by the Seahawks' C.J. Prosise. It is imperative that they make the Packers one-dimensional in this game by stopping the run early and often. On a number of our "five matchups to watch" this season, we've mentioned the Eagles' outstanding special teams as a potential equalizer against teams who are more talented than them. This week against Green Bay, the Birds will be facing a special teams unit that is ranked 27th in the NFL by Football Outsiders. (The Eagles are ranked first). More specifically, the Packers' kickoff coverage units are ranked dead last in the NFL by Football Outsiders, while the Eagles are ranked first in kick returns, which lines up with the stats. The Eagles lead the NFL in kick return average, at 33.7 yards per kick return. The Packers, meanwhile, are allowing 30.5 yards per kick return. This could be another week where the Eagles pop a big return.